This creamy dessert is fancy enough for a dinner party, but easy enough to make on a weeknight because there is no cooking required! I like making it gluten-free by using GF ginger snaps, but you can also use Graham crackers. The coconut butter is optional, but it does make the coconut whipped cream even creamier. For best results, make this dessert at least 3 hours before serving. Using a stand mixer or hand mixer, beat the avocado until creamy. Add in the pumpkin puree, vanilla extract, spice and sugar and beat until smooth. Transfer to a bowl and cover with plastic wrap (let it touch the top of the pumpkin mixture so a film doesn’t form). Place in the refrigerator until ready to use. Open the can of coconut milk and drain off as much of the water as possible. Place into the bowl of the stand mixer and beat on high for about 5 minutes, until thick. Add in the powdered sugar, vanilla and coconut butter and blend again for 1 minute. Cover with plastic wrap and place in the refrigerator until ready to use. 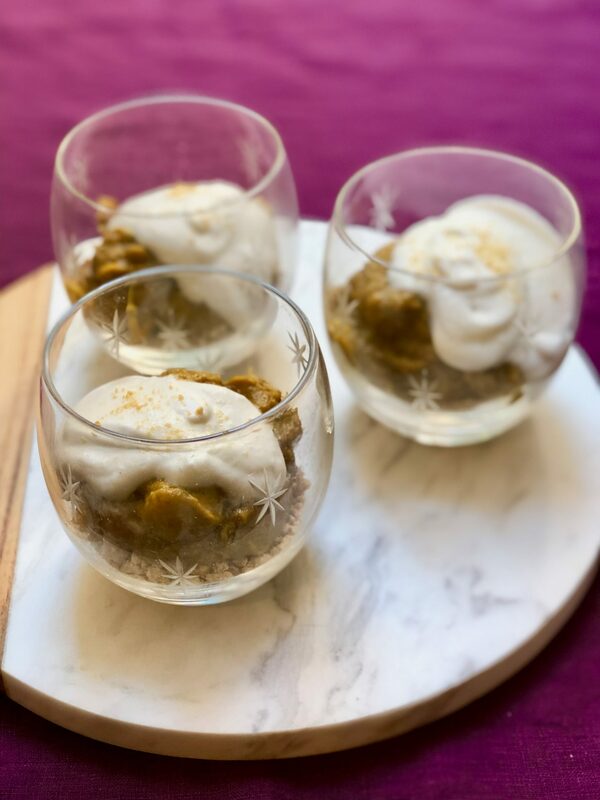 When ready to assemble, place ¼ cup of the crushed ginger snaps into each of the dessert glasses or jars. Top with ¼ cup, plus 1 tablespoon of the pumpkin mixture, followed by about 2 tablespoons of the coconut cream. Cover with plastic wrap (or place lids on jars) and transfer to the refrigerator for at least 3 hours or up to one day. The longer you leave them in the refrigerator, the softer the crumbs become. Sprinkle a little extra pumpkin pie spice on top before serving if you like.